Welcome readers, to our first City Arc blog post of the year! I’ll be your tour guide as we check out what’s been going on in the Green Band so far. The Greenies are hard at work on various City explorations, so if you follow me I’ll show you what they’ve been working on! To the left, you’ll see the historic Bernal Hill, and to the right, the De Young Observation Tower. Both locations have been sites of inspiration for poetry writing in the Green Band. That’s right, folks, the Greenies have been studying poetry! Not only have we sought out different landmarks to inspire us, but we’ve also been studying poetry in the band space. 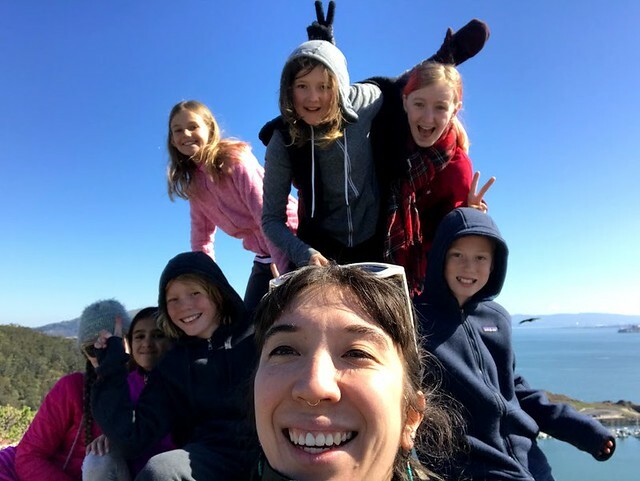 We’ve read and listened to some famous poets such as Langston Hughes and Frank O’hara, as well as those we don’t immediately think of, like Eminem, to expand our understanding of what constitutes poetry. We’ve also been studying literary devices including similes, metaphor, alliteration and our favorite—onomatopoeia—and finding them all around us, in music, prose, poetry and in our conversations! Next step for the Greenies? In conjunction with our reading of Crossover by Kwame Alexander—a narrative book told completely in verse—Greenies will be writing their own narrative poems. 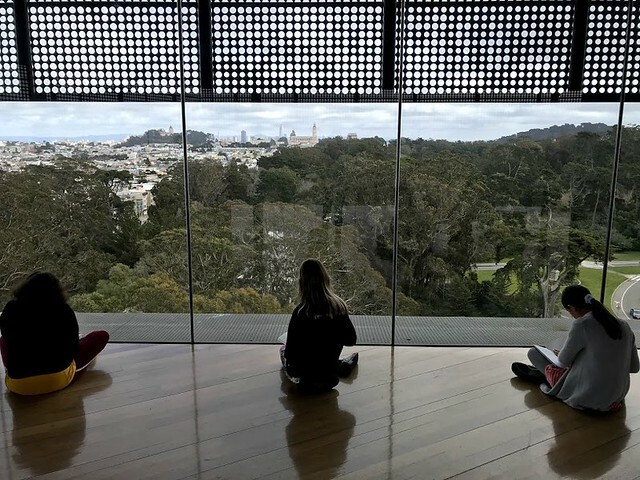 Aaliyah, Lucy and Gita writing poetry at the De Young. As a tourist, I’m sure you guys appreciate a good map. If you take a close look in our Band Space, you’ll probably notice that Greenies do too! Not only do we have a world map, but we have maps of Brightworks, created by the Greenies themselves for our study of scale! 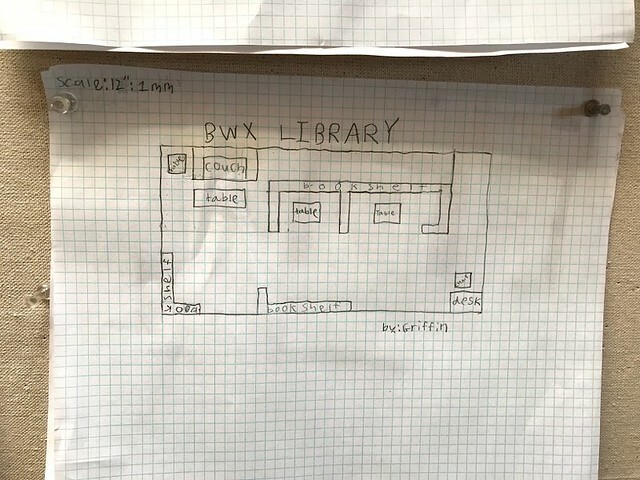 Each student picked one area of the BWX warehouse—band spaces, the kitchen, office, library etc., measured the space and furniture, and then drew it to scale on graph paper. Each student chose their own scale to draw their space to, but when we put our drawings together, we realized this was a problem that prevented us from making a truly realistic map! What a learning experience. Next up in our study of scale, Greenies will be picking a SF landmark to recreate in 3D to scale. This time kiddos will have to choose a scale together so that we can make a realistic model of the city. Griffin’s scale drawing of the library. Ladies and gents, as you may have noticed on this tour, there are a lot of homeless people throughout the city. Because homeless people are a part of the SF community (although not always treated as such) and add to the culture of the city, it seemed appropriate that we would study the city’s homeless population. In addition to asking ourselves “What are the factors that cause homelessness?” we are also wondering “How can we help homeless people?” We started our study listening to a KQED podcast on first topic, and then watched a presentation by the founder of Lava Mae (and Tamasen’s mom), Doniece Sandoval on one way to address the latter. 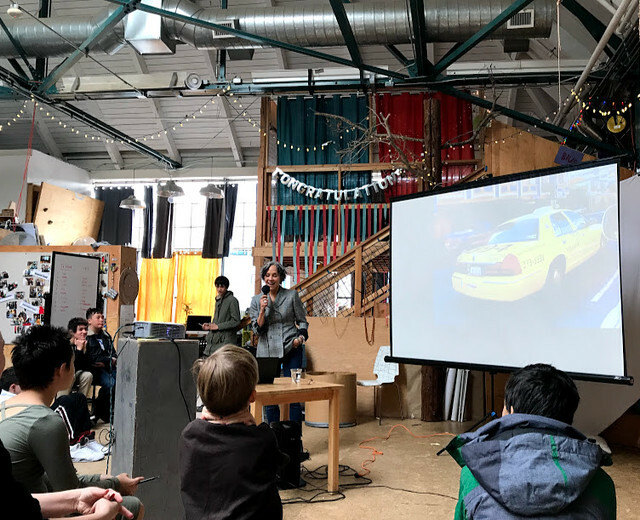 Moving forward, Greenies are going to break into pairs to study different issues facing the homeless community, and come up with ways to try and help the issues, much like Ms. Sandoval did. Ms. Sandoval’s presentating on Lava Mae. I hope you enjoyed your tour of Green Band’s City Arc. Check back soon to learn more about our explorations!